Approximately 40 km south of Oamaru, huge spherical stones scattered on the gray beach. Some rocks are partially submerged in the sand beach. Smooth outer surface of the stone, but the bottom layer has a texture very complicated. In addition, Oamaru is a place to see a blue penguin colony and the yellow-eyed penguin, which is nearly 250 km in south Christchurch, this location can be reached from Oamaru towards Dunedin. This large round rock origin of limestone carbonate crystals were pulled from the mud sediment containing shellfish and marine plants around it. Of course this isn’t a short process, but it takes about 60 million years before finally forming a round rock with a diameter of about 2 meters. Surrounding small stone taken many visitors for souvenirs thereby leaving only the large rocks that may not be moved by man. Accommodation around Moeraki Boulders quite expensive, most charge more than 100 NZD. However, if forced to stay, travelers can stay at Moeraki Village Holiday Park which offers cabins and motel rooms ranging from 50 NZD. This property is located at 114 Haven St. Moeraki, Otago. 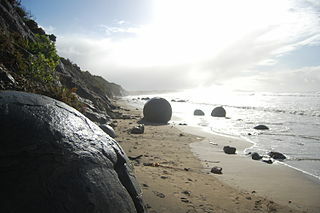 To be able to go to the Moeraki Boulders, Coastline Tours is one of the tour bus routes serving Dunedin – Oamaru. This bus will stop at the Moeraki Boulders members know in advance if a passenger. Buses usually depart from the Octagon, Dunedin at 2pm and arrived at about 4 pm Oamari. The travel time from Dunedin to the Moeraki Boulders about 1 hour. Tariff bus is 30 NZD to 12 NZD for adults and children. If you don’t want to stay at the Moeraki Boulders, Dunedin many tour agencies that offer tour packages daily commute with a duration of about 4 hours. Recommended restaurants around Moeraki Boulders which travelers can visit is Fleur’s Place that sells a variety of seafood dishes. This restaurant is located in the Old Jetty and is open from 9 am until evening.